Jack Richeson & Co. Inc. Badger Blender Faux Finishing Brush , 3"
Home > Art Instruction DVDs & Art Education | Art Materials Articles & Tips | Jack Richeson & Co. Inc. Badger Blender Faux Finishing Brush , 3"
Our last stock of these were from our 2012 stocking when they were still legal. Unfortunately they had to be discontinued. We do not believe this brush with natural hairs will come back to the USA. A 3” Richeson faux finishing brush and it is designed with the utmost in care and craftsmanship by Richeson. This brush is a masterpiece it well fit well in your tool set. Made of select bundles of hair mounted onto a wooden handle. 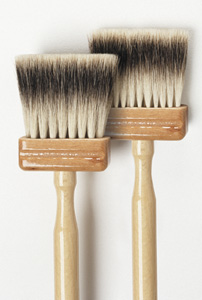 This brush is perfect for faux finishing and it measures around 3” wide and 3” long. The lacquered wood handle is easy to work with. Richeson brushes are some of the best in the world, and you will be satisfied with the quality and care that was put into creating this brush. A great addition to your brush collection, it is designed to be durable and convenient to work with.